Home Writing	Do you think that learning about the past has no value for the present? 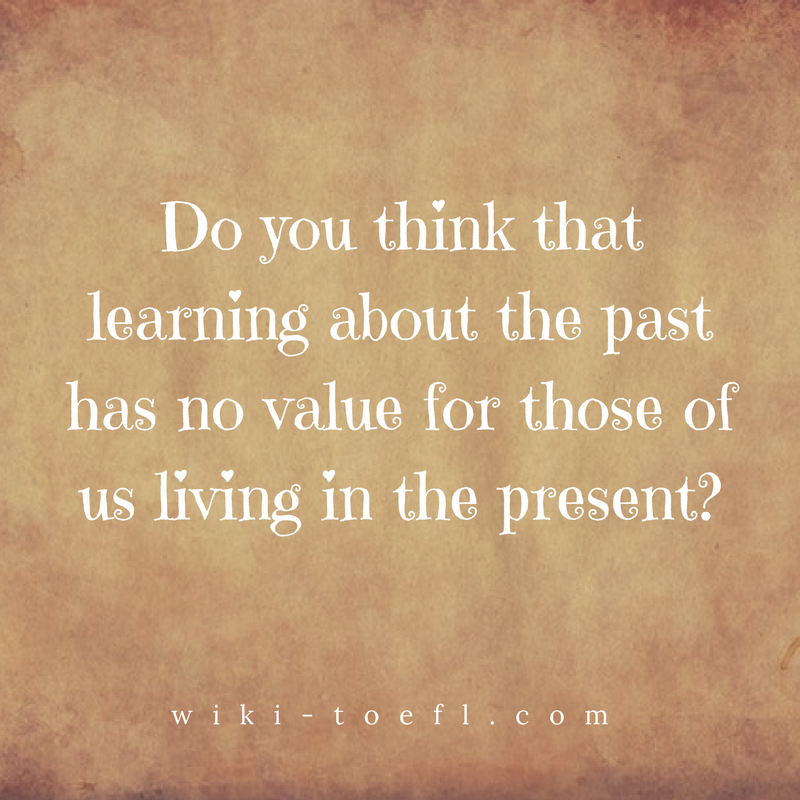 Learning about the past has no value for those of us living in the present. Do you agree or disagree? People often say “ Those who don’t understand history will repeat the mistakes of the past.” I totally disagree. I don’t see any evidence that people have made smart decisions based on their knowledge of the past. To me, the present is what is important, not the past. I think that people, the weather, and politics determine what happens, not the past. People can change. We can’t assume that people will continue to hate one another just because they have had hated one another for years. Look at Turkey and Greece. When Turkey had an earthquake, Greece sent aid. When Greece had an earthquake, Turkey sent aid. Now, these two countries are cooperating and looking forward to improved relations. No doubt, if we looked at the past, we could have thought this was a lost cause. But people change. The weather can change. Farmers think that they can plant certain crops because these crops have always grown well in their fields before. But the weather can change. There can be a long drought. The crops that have always worked well , will die. A drought-resistant crop needs to be tried. If we looked at the past, we would not have changed our crop and we would have lost our farm. Weather changes. Politics an change. According to my way of thinking, politicians must be responsive to changes in the people. If politicians looked only at the past, they would always say the same thing. People change. On the whole, people today care about human rights. They warn all people to have the equal rights. If we looked at the past in the United States, we would see a lot of discrimination against races, women, and sexual orientation. Now, that is changing. Politicians changes, too. As a rule what is important today is to follow the mood of the moment. We can’t be looked in the past. It doesn’t do us any good to think about the past. People, the weather, and politics can change in any direction. The direction of this change, in my opinion, can not be predicted by studying the past.